Do you play slide guitar? What do you use for your slide? Want to learn slide guitar? What are your choices for slide? There are a large variety of objects and materials that have been used to “slide” along the length of a guitar string to produce that unique tone. The dull edge of a knife or maybe the rounded handle of a butter knife could, and have been used. A length of pipe can be used. But one of the most popular choices is also an alternate name for slide guitar, a bottleneck. 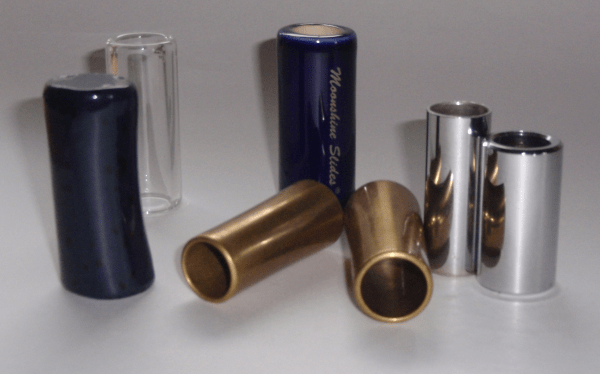 Your local music store probably sells a variety of guitar slides, and if you don’t have a local music store, you can find a huge selection of slides at online retailers. The good news is almost all commercially produced guitar slides cost less than $20. That’s an important number to keep in mind because most guitarists who become interested in slide guitar eventually want to attempt to make their own bottleneck slide. You will need an empty wine bottle which is free. But depending on the method you choose to make the slide and whether you already own any required tools, you could easily spend much more than $20 to make your slide. Only you can decide if that’s worthwhile. Slides come in different materials, different shapes, different finishes and different sizes. Here’s some of the variations you can choose from. Flared – good if strings/fingerboard have a smaller radius. 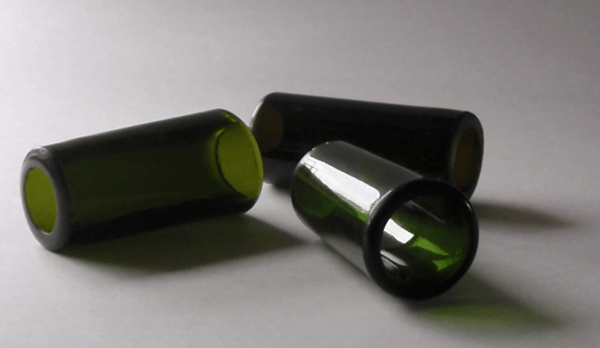 Bottleneck slides can be made “single cut” where the cork end is not cut off or “double cut” where the bottle is cut twice. Once to remove the thicker cork end and once at the “bottle” end. Look at picture or videos of Bonnie Raitt playing slide. She uses a single cut bottleneck. I prefer to make double cut slides. Non-“tube” designs such as the Shubb half slide or the JetSlide. Sizes to fit your finger. This may be expressed in diameter (e.g. 19 mm) or ring size or simply small, medium or large. But it needs to fit and feel comfortable on whichever finger you wear it. Different Lengths. There are short and ring slides used for single string sliding only. There are long slides that can easily slide along all six strings for full chords. And there is everything in between. Many years ago if you wanted a slide you had to make it. There were no (or few) commercial slides for sale. One source for slides that several famous guitarists have used is the tool box. 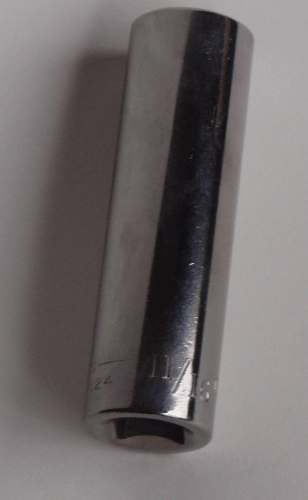 A deep socket for a socket wrench is usually heavy chromed steel and has a nice smooth surface. You can pick the size that fits you (somewhere around 11/16th inch or 18 to 19 mm metric works for me). The top (as worn) that fits onto the wrench is a bit of nuisance – it makes the slide heavier than need be. I’ve read that some have had the socket end cut off. It’s strong steel and you probably don’t have the tools to cut and polish it at home, but it could be done. I’ve read this is what Rory Block uses for a slide, though perhaps she’s had hers modified. However, you can probably find a heavy chromed steel slide commercially instead. JetSlide. The JetSlide is made to be worn like a ring, rotate out of your way to play standard guitar and then flip into position with a full fingerboard width slide when needed. Unlike most slides for roundneck guitars, this is not based on a pipe or tube concept but on a solid bar. I’ve wanted to try one of these, but I already have too many slides. Maybe someone will get me one for a present sometime. Shubb Slide. The Shubb Axys Reversible Guitar Slide is another design that rotates into position when needed for slide and (theoretically) out of the way when not needed. The working end is essentially a brass tube design split in half the long way. Dunlop “Shy Slide” This design is a split tube similar to the Shubb Axys above. It is a short slide designed to be worn more like a ring. The unique aspect, beyond this, is the Velcro strap that allows one size to fit all. Fender Anodized Aluminum Slide Candy Apple Red Big Heart was the first company I had found who made aluminum slides. I can no longer find the Big Heart aluminum slide on any online sites. Maybe this Fender is made by Big Heart. In any case, I think an aluminum slide is an unusual material. I’m sure it produces a unique tone. Given that many guitarists prefer heavy substantial materials for their slide, lightweight aluminum is quite different. Previous Post:Where do you wear your slide?